Benjamin Franklin Hudson was the son of William "Buck" Hudson and Mary B. Moore. This family was in Jones County, Georgia in 1850 and 1860. According to the 1850 Jones County, Georgia census, Benjamin's siblings were as follows: Matilda, John, William, Sarah, Camilla, Amelia, David B., Mary, and Louisa. 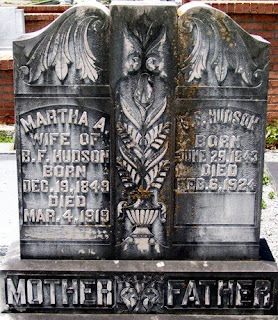 According to an 1867 will abstract for William "Buck" Hudson from Book E, Jones County wills, these were his children: John W. Hudson, William Hudson, David B. Hudson, Benjamin Franklin Hudson, Barnwell R. Hudson, Matilda Lipsey, Sarah Rice, Louisa Hudson, and Mary Felts. Pvt. William J. Lipsey [possible brother-in-law] (1834-1864) *Co F 45th GA.
Interestingly enough, I did not find out for sure if Benjamin was a soldier during the Civil War. Benjamin Franklin Hudson married Martha A. before 1880. I found them in Jones County, Georgia then as well as in 1900. 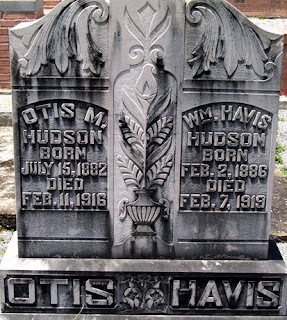 Their children listed in 1900 were William H., Andrew L., Ora B, and Otis M.
William was living in Walden, Bibb County, Georgia at the time of registration in 1918. He was farming for his father B. F. Hudson, and he was listed as having blue eyes and dark hair. The funeral services of Mrs. Martha Hudson, wife of Frank Hudson, were held from Sardis Church yesterday afternoon at 3 o'clock. Elder Walter Heard conducted the services, and the interment was in Sardis cemetery. Mrs. Hudson lived at Rutland and was ill several weeks. She died at 3 o'clock Tuesday afternoon. Mr. Benjamin Franklin Hudson lived less than five more years before being laid to rest next to his wife.